Cover artwork: Photograph © Gerard Collett. Schubert's Schwanengesang is here performed in a new English translation by Jeremy Sams: songs of love and songs of horror all the more eviscerating 'in the vernacular'. English versions of two other major songs—mini cantatas almost—from Schubert's final year complete the programme, Sophie Bevan performing Der Hirt auf dem Felsen and Auf dem Strom with obbligato contributions from Julian Bliss and Alec Frank-Gemmill. Loneliness and longing fill the songs of Schubert’s last year. Between the completion of Winter Journey in October 1827 and his death, aged 31, in November 1828, he turned to two new poets, Ludwig Rellstab and Heinrich Heine, with a set of songs apiece. After the composer’s death, they were gathered together by the publisher Tobias Haslinger, who issued them, along with a little epilogue (and a canny sense of what would sell), as Franz Schubert’s Swansong. If Winter Journey has the richness of a novel told in song, then Swansong is more like a collection of short stories. Fourteen very different characters come in and out of focus, with little in common except their aloneness. Two other solitary figures—a lovelorn shepherd and a restless sea-voyager—are depicted in longer works, also from 1828, where a solo instrument partners the voice. Right up until the end, it seems, Schubert was experimenting with new ways to tell stories in song. And storytelling is to the fore in the new translations by Jeremy Sams performed here, which recreate the directness and immediacy of the poetry that inspired Schubert for English-speaking listeners. Schubert had been a torch-bearer at Beethoven’s funeral in 1827 and we can sense, even at this distance, how his death both grieved and liberated the younger composer. His most public tribute came with a setting of On the river, one of a bundle of poems the writer Ludwig Rellstab had sent to Beethoven, who in turn left them in his estate to Schubert. It’s a poem of farewell—and Schubert didn’t miss the chance to pay homage to the composer that Vienna was still mourning, ennobling the song with a solo horn part that at one point quotes the funeral march from the 'Eroica' symphony, and making it the centrepiece of a concert held on the first anniversary of Beethoven’s death. 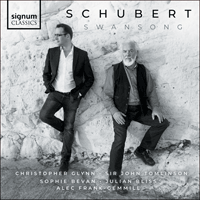 Seven other Rellstab settings form the first half of Swansong and find Schubert at his most illustrative and assured. The brook that ripples throughout Love’s message is depicted as vividly as a soldier’s shifting moods in the eve-of-battle scene Warrior’s foreboding. The propulsive energy of Longing for spring builds a tender excitement, punctuated by fleeting moments of doubt, before finally giving way to the most famous tune Schubert ever wrote in Serenade. Other songs portray various incarnations of the archetypal romantic Wanderer, living on the margins of society. Defiance and dignity mingle with a torrent of emotion in My home. The curse of ‘bittersweet memories’ haunts Far away. Most exhilarating of all is the perpetual motion of Leave-taking, a riding song, where the horse finally trots out of sight after six verses to clear the stage for a very different poet. Heinrich Heine may have been two years older than Ludwig Rellstab but he belonged to the future, used fewer words, and made them mean more. His lyrics are simple and artless on the surface but spiked with wit, cynicism and irony. And Schubert, too, sharpens his style. In Atlas, the wretched Titan of Greek mythology has never seemed more human, railing against his fate in music that (as we now see it) touches the worlds of Wagner and Verdi. The gloom is carried over into Her picture, which expresses a depth of sorrow that makes a stark contrast to the easy charm on display in The fisher maiden. Two more seascapes (from a composer who never saw the sea) follow, one hypnotic and obsessive, the other grief-stricken and embittered. And then Schubert’s bleakest and most traumatic song, Doppelgänger, looks death in the eye, only to find it staring back, mocking all human suffering. The final, unexpectedly major chord of Doppelgänger is a mystery. If we hear in it a hint of ‘All shall be well’—a benediction from Schubert not present in Heine—then it is echoed in the hopeful, humble-spirited epilogue that follows. Johann Seidl was no Heine, but his poem about a homing pigeon inspired a song that is, in its way, just as much of a miracle as Dopplegänger. The effect is familiar from the scherzos and finales of Schubert’s late instrumental works, which often seem to recall happiness, even jollity, in the midst of desolation. The loyal bird, we learn in the last line, is called ‘Longing’ but there is no hint of self-pity in the music and Swansong closes in generous and companionable mood. Here, perhaps, is Schubert’s antidote to Heine’s despair, as well as his own. It’s heard in the song-cantata The shepherd on the rock too. A clarinet melody sets the scene; we are on top of a mountain with a broken-hearted shepherd. The clarinet mourns alongside him as he sings out his pain. But grief finally turns to hope, as quickly as a change in the Alpine weather. ‘Springtime is coming’ the shepherd sings, ‘and I must be ready to journey again’. Schubert always was a shapeshifter, but never more so than in his last and greatest year. The music seems only more remarkable when we notice that the manuscript is dated October 1828. Schubert was by then standing on a precipice of his own, cared for by his brother Ferdinand, battling typhus and tertiary syphilis, and surely knowing he would not see another spring. Schubert’s Schwanengesang, though not itself a cycle, is a logical extension of Die schöne Müllerin and Winterreise. Here again are the brooks and the birds, the jilted suitors leaving town, the lovers looking at or into the beloved’s house. Loss and longing are everywhere. But if Die schöne Müllerin is about hope (finding someone to love) and Winterreise is about despair (leaving someone loved), Schwanengesang is about resignation. The beloved is not by your side and one can deal with that in different ways. By sending messages via rivers, trees or even pigeons. By flight, by self-imposed exile, by dreaming of what might have been and by accepting what never will. The distant or absent beloved is present in almost every song, and though there is no journey involved as in the previous cycles, there is a unity in this collection which shows one where Schubert’s thoughts were. He knew he was going to die and die alone. I’m glad, though, that I translated them in the order in which they were written. For here, suddenly, one comes across a major challenge. A Great Poet, Heinrich Heine, before whom the mere versifier should genuflect. But of course, Schubert does nothing of the sort. He draws from Heine what he needs, just as he does from Rellstab in this collection and Müller in the others. And what he gets from Heine one can hear in the music. Monolithic, massive, Beethoven and beyond. A glimpse of what might have been but could never have been.